Android is an operating system that allows a high degree of flexibility to suit all types of users. It has apps that can make life easier for people with vision problems, restricted modes for children and simplified launchers for older people. Smartphones have many options and are a great tool for many people, but this same diversity can be a problem for some people of a certain age. Many people would like to have a phone just to make a call, send a message and use minimal extra features, but the amount of apps installed and the configuration options can be overwhelming. A good option consists on installing a laucher to simplify the options and offer a clearer view of the apps that interest us the most. There are several apps on the market that meet these requirements, with more or less customization options and different prices. We will discuss here some of the most interesting that we can find in the Play Store. Nectar is a simplified laucher with big icons and big letter size on the screen, with an interface showing a pale blue or green with a significant contrast. 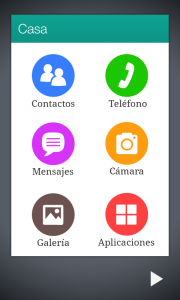 With this launcher, we have access to all the original settings of the smartphone, even if we are not going to use them. Nectar can access quickly and easily to the calls history (missed or made), as well as messages, camera phone, and photo gallery. You can also show clearly our position if we are using it as a GPS. Finally, like other apps of this type, it includes an SOS button that can be configured to automatically call a preset phone number or alert an ambulance. It can be downloaded for free from the Play Store. It is a very complete application designed to facilitate the use of people with impaired vision. 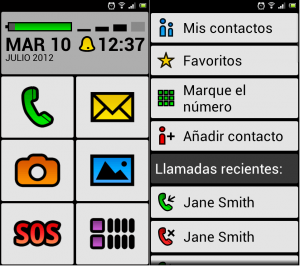 The icons and text are displayed with a much enlarged size, the call history is simplified and the dial also shows a much greater numbers than usual on any smartphone. Like other adapted launchers, we have an SOS button that can be configured to automatically call whoever we want, also sending a notice of our location with our GPS coordinates. Big Launcher is available in the Play Store for a price of 8 €. Wiser is another great option to simplify the smartphone. Similarly the other two applications, the app install a launcher visually simple and easy to use with the basic phone functions. 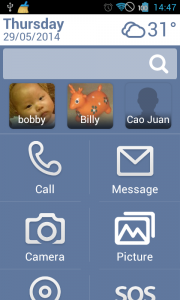 Thus, we can directly access the camera, make a call, read messages or access the applications menu. All other menus follow the same aesthetic as the main page with enhanced icons, a marker with large, clear numbers and a visual and organized contact list. Wiser is available on the Google Play for free.